Sometimes, the answer to a complex problem is so simple, so elegant that you wonder why you didn’t think of it yourself. That was my reaction yesterday as I sat at the World Science Festival Summit and listened to Columbia University professor Dickson Despommier describe an ingenious idea that could ultimately ease the world’s food, water, and energy crises. He calls it vertical farming, and he wasn’t talking about growing pole beans. This is agriculture on the 34th floor of a big city skyscraper. Despommier has been working on vertical farming for more than 10 years, inspired by population experts that foresee over 9 billion people on the planet by 2050. Finally, someone in grape valley climbed out of the wine cellar to figure out what wine drinkers really want aside from great taste: peel-off wine labels. 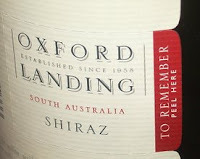 According to Trend Central, an Australian wine producer, Oxford Landing, is offering this consumer-friendly perk on their Shiraz . It’s no wonder since there are dozens of Internet sites that are willing to teach you how peel off a wine bottle label without shredding it—a near impossible feat, of course. I’ve discovered that it’s easier to remove an RFID tag from and iPod than it is to remove a wine label from a great bottle of 2001 Brunello. Jacqueline Leo is an award-winning editor and former president of The Fiscal Times. Her latest book, SEVEN: the Number for Happiness, Love, and Success, explores how the human mind organizes information into limited "chunks" to avoid chaos.